The powerful European Commission President, Jose Manuel Barroso, has won a second term of office after a majority of Euro MPs voted for him. Mr Barroso, 53, was the only candidate in the European Parliament vote. A former Portuguese prime minister, he will serve a new five-year term. In the secret ballot 382 MEPs voted for him, 219 against and 117 abstained. The Commission president heads the EU's executive arm. Leaders of the 27 member states have already backed Mr Barroso. He faced some opposition from Socialists and others on the left in the 736-seat parliament. A total of 718 MEPs took part in Wednesday's vote. The Commission drafts EU laws, which then go to the parliament and member states' governments for approval. The parliament is the only directly elected EU institution. In his acceptance speech, Mr Barroso said that as head of the Commission "my party is going to be Europe". "Anyone who wants to come on board for this exciting journey, that is the construction of a united Europe, it is with them that I would like to build the necessary consensus to strengthen the European project," he told MEPs. He now faces the task of assembling a new team of 26 other commissioners, who will take office on 1 January. But these appointments cannot begin until Irish voters give their verdict on the Lisbon Treaty in a second referendum on 2 October. Mr Barroso is the first Commission president to be re-elected since Jacques Delors, who spearheaded EU integration from 1985 to 1994. 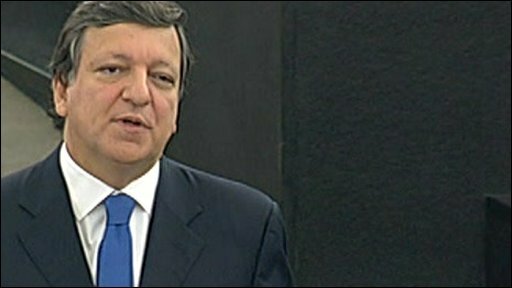 Critics accuse Mr Barroso of pandering to national governments and of promoting market liberalism which contributed to the financial crisis. He pitched openly for the votes of left-wing and liberal MEPs in a speech in Strasbourg on Tuesday. He emphasised his commitment to social policy, including equal pay for women. He pledged to look again at existing laws to ensure that established workers were not undercut by cheap labour from other EU states. Mr Barroso also promised a new post of commissioner for civil liberties and minority rights. The largest group of MEPs, the centre-right European People's Party (EPP), voiced support for Mr Barroso, but its leader Joseph Daul warned him that "this is not a blank cheque and you will have to fulfil our expectations". The leader of the Socialist group (S&D), Martin Schulz, instead called for "a real change of direction in the EU". The S&D includes the British Labour group, whose leader Glenis Willmott called for more concrete proposals from the Commission to address the economic crisis. "Frankly, we are disappointed with what he is currently proposing," she said in a statement. "We want action to create employment, new and better jobs, fight mass unemployment - especially youth unemployment - promote equal pay and improve workers' rights." The liberal group ALDE said it would support Mr Barroso, but urged him to beef up banking supervision. The leader of the Conservative MEPs, Timothy Kirkhope, said Mr Barroso was "the only credible candidate". The Conservatives are in a new bloc called European Conservatives and Reformists (ECR). "Whilst not perfect, and whilst we have had disagreements with Mr Barroso in the past, and are bound to again in the future, he impressed us when he spoke to our group with his candour, his no-nonsense approach and his commitment not to be swayed by dogmatic socialist ideology," he said. A prominent Greens/EFA leader, Daniel Cohn-Bendit, voiced opposition to Mr Barroso, saying "we think we deserve somebody better". He added that the vote should have been postponed until after the Irish referendum on 2 October.